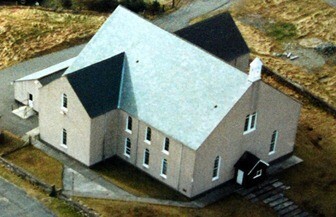 Garrabost School Road Church and Garrabost Main Road Church. We encourage all our members to engage in mission locally and to have an interest and involvement in mission nationally and internationally. In personal evangelism members live out their Christian faith by interacting with neighbours and becoming involved in activities in their own localities. We also hold mission meetings from time to time. Some of these will involve an invited speaker actively involved in a particular mission or someone from a mission agency, such as Tearfund , OMF , Latin Link or CWI . All our worship services are linked to mission. We encourage all who attend regularly to invite others to come to church with them. Some of our services will be structured for family attendance while at other times we focus particularly on the unchurched. Our main youth activity for Secondary 1 age upwards is carried out through "Point 2 Life", which meets on Sunday evenings at 8.30pm in the Aird Community Centre. Activities range from fellowship meetings on Sunday evenings to "weekend away" trips to the mainland. A a lift is provided for any who need transport. Every month or so, on Sunday evenings at 8.30pm, the group joins with other similar groups at various events. Again transport is provided. Please check the Point 2 Life dedicated page of the website for more details and contributions from leaders and some of the young people involved. The young people who attend the meetings can also keep up with news on the Point 2 Life Facebook page and in the weekly Intimations. Sunday School meets every Sunday morning at 12-15 during the morning service during term times, for ages 5-14. The children come to the service with parents and after a talk from the minister they leave after the second singing to go to their classes. The teaching sessions finish at the same time as the service at approximately 1.15pm. We regard the children as an integral and important part of the congregation's life and work. New families are most welcome at any time. All our Sunday School staff are fully approved in accordance with child protection legislation. A variety of teaching materials is used, including Go Teach and materials produced by the Free Church. As part of the overall "Women For Missions" (WFM) movement in the Free Church of Scotland congregations like our own have a local WFM group. The WFM aims to support the work of mission particularly the Free Church's mission work overseas in Peru, Colombia, South Africa and India, by promoting the various facets of the work and by raising funds. Each year the main WFM committee decide on a project overseas that requires financial aid and this is then highlighted throughout the church so that funds can be raised during the course of the year. Garrabost WFM has contributed over £1,000.00 each year towards the projects. Meetings are held on a Tuesday evening, most months, in the church hall at Garrabost Main Road and School Road buildings as well as at the Garrabost manse. Meetings involve a variety of activities, ranging from cooking, decorating and tapestry demonstrations to missionary presentations. Every meeting has a bring-and-buy stall from which most of the funds are generated. Congregational Meals, such as Soup & Pudding Lunches and Supper Evenings are also arranged from time to time and donations given on entrance at these events go towards Mission funds. See the WFM page Women For Mission for more details.